Honestly, I hate the urban dictionary word deemed “Mompreneur”. I mean it’s a clever take in a society that lives for name combinations. It’s fine, but sometimes it makes me feel a little under-valued, maybe? Like I am not an all-the-way entrepreneur. Like I have one foot out the door or something. Buuuut, I think those feeling are just the ones that I project on to myself–which is also a key part in this post. Guilt is silly, when the truth of the matter is-“mompreneurs” are actually quite savvy. As we go thru life managing not only our businesses and dreams, we are managing our children and their well-being, our marriages and relationships have to be tended to with proper timing and care. So for the sake of relevance, I wanted to post to all of my Mompreneur sistas out there today. I wanted to share with you some tips that I WISH I would have known before I set out on this journey solo. Now, NONE of this would have changed my mind at all! I think I just think it would have helped me become a little more resilient a little quicker. But, nonetheless, here we are-some of us go before others to impart what they find! So, I hope you will find this helpful and encouraging as you go out on your own and take the plunge…. Don’t try to find balance. It just doesn’t exist. In fact, I write about that A LOT. You can read more here and here just to give you an idea of my stance on balance. Listen, balance is simply exhausting. And while it sounds like a good thing, ultimately, trying to find balance leads to burn-out. If you are going to operate a business-some things are going to suffer. If you are the mama of littles and want to start a shop, there probably will not be a lot of time spent at home. If you are working full-time and coming home to kids sports and homework-there may not be a lot of time for gourmet cooking. Some thing will ALWAYS have to give when you start a business and want to make it thrive. And thriving is the difference between a business and hobby. So, make sure you know that up front-if you actually want to make money doing this gig, your pie chart will look different this season. And you know what? If you can just settle into that-it will be fine! It’s the over-action that produces the burnout. Keep LOVING your family and kids as priority. Lavish them to pieces. And know that LOVING doesn’t always mean every ounce of your time. I say, be all in when you are in! Be 100% present when you are in their presence. THAT is where you will have to make the commitment to put the phone down as soon as pick-up line happens. No more emails responses after 5p. This past summer, I had to batch work like CRAZY! I did not create very much time for work so I could be with my kids, but maaaan, the time I did create for myself was used until the last second! But, you know what? I got a LOT done that way. Whatever the boundaries are to make it work-make the boundaries, but do not seek balance. Draw some hard lines in the sand early on. In other words, you cannot please everyone so don’t even try. This will actually HELP you. My mentor, Jill Coleman, gave me that advice and it has been magic! I remember as a young trainer, I took on EVERYone. High school athletes, elderly women, pregnant people, men…everyone. And my approach was pretty one-dimensional. But trying to not be made me exhausted. I did not know who I was as a trainer. It wasn’t until YEARS later I knew definitely that I LOVED working with moms and hormone education. And that I am anti-diet. And all about a moderation lifestyle. Saying NO to all other things helps my business. It helps me get niched out. I can openly say, “if you want to get super skinny, I ain’t yo girl.” And while at first turning down potential clients feels a little crazy, it actually is the opposite. You attract people attracted to YOUR approach and YOUR material or product. Someone parting ways with you because they have different needs is a GREAT thing. It gives you more room to serve people who will be your tribe and always be excited about your services or products. This goes for all areas of business. Get clear on your message and get clear on your goals and ideals which will help you find your IDEAL CLIENT. Don’t flounder around trying to appease and serve everyone out there. PS>>YOU WILL INDEED GET SOME HATERS. It’s all good though-for every hater, you get 10 or 20 or 100 people who get what you are doing! Don’t forget that success takes time. My husband is a super successful entrepreneur. I watch and study his behaviors and ask for his advice. At first, when I went into the fitness business on my own, I felt super insecure. I am married to a superstar and I was a little fish in a saturated market. It makes me laugh now though because I also seemed to forget the absolute GRIND he put in it in the beginning of his businesses. Late, late, SUPER late nights and early mornings. Relentless trouble shooting. Phones calls at all hours of the night with employees, clients, and potentials calling with questions and urgent matters. No salary. No compensation. IT WAS A LOT! And it took years to be successful. Funny how we often expect our great ideas to just be successful because WE KNOW they are good ideas! Good ideas are awesome, but there are a zillion out there. You have to be consistent every.single.day. You have to show up with expectancy, but also not quit when the response seems dismal. It’s work. It’s fun, but it’s also….work. Be prepared to work for a while! Again, my mentor, Jill Coleman, always says, “Don’t compare your year one to their year six.” That’s not fair to you and not fair to the time “they” put into their biz! Greatness takes time, friends. Don’t be afraid to admit that you don’t know what you don’t know (and get with people who DO know). When I wanted to take my fitness business to the next level and take it online, I had NO CLUE how to do that. Like, didn’t even know how to connect a cart to my website. Thankfully, I had a great friend, Alison, who walked me through all the logistics of a website. BUT I was soooo stuck in getting my name out there outside of my small town. I wanted to get out of the same circulation. I needed major help on marketing, and lead magnets and content creation and programming. I can make up workouts in my sleep, but that does no good if I cannot deliver! So, I made an investment in myself. I joined a business mentorship of other fitness professionals starting online businesses led by Jill Coleman (can you see how much I have learned from her?). This was pricey, of course, but I had to count the cost. What if I DIDN’T do it? What if I just went on doing things the way I had been doing them? Chances are-I would have spun my wheels and gotten no where. Being in a mentorship has lit a fire under me to jump and jump again. Sometimes winning big, sometimes falling flat. But doing it, trying it, learning it, creating it. IT HAS CHANGED MY WHOLE MINDSET. And it has been educational and valuable. And while you are not required to get into a mentorship or a mastermind, I would then highly suggest getting with some seasoned pro’s in your industry and offering to PAY for consults with them. BTW-NO ONE LIKES THEIR “BRAINS PICKED” OVER COFFEE. I know that sounds harsh, but honestly, it sort of insults what people do…especially when you are essentially going to be in the same industry as they are. And I do not mean if they are your friends–I have several true friends who do what I do and we eat lunch and talk about business! I am talking about people you know of or know from a far or as a peer or colleague. A good gauge would be to ask yourself if it would be semi-random or catch them off-guard for you to ask them for professional advice and wisdom. If you think it would be a little awkward, then make it more professional. Ask direct & specific questions if you are seeking advice–offer to work under them for a while for free or a small fee if they have a spot available for you, or ask them if they charge a consult fee and offer to pay one whether or not they have it. They may say, “NO WAY! I would be happy to have coffee and give you the goods!”-either way, it is just nice to offer to show you VALUE someone for their time and expertise. Bottom line: there is a lot more to business than your specific talent or gift. Marketing, manufacturing, creation, affiliations–it’s a lot! Don’t be afraid to get expertise (and often that means PAYING for it). Consider it an invaluable investment! It might be lonely. Some lucky friends go into business together. I always admire friends who create something together. It is a built-in, co-worker system with a shared dream. So so cool. But for a lot of us, that does not happen and we are flying solo. I knew when I committed firmly to treating NWF as a business and not a hobby, that I would have to eliminate a lot of my social life in the daytime. Before I took it next level, when my kids were in school, I was mainly shopping, lunching or doing stuff around the house and just doing NWF when I had time. This past year, I have probably purposefully shopped a handful of times and I RARELY go out to lunch with people unless it is a special occasion or I feel a deep loneliness that becomes unhealthy. And that’s the thing to remember–don’t isolate, buuuuuut also, you have to block out lots of time to get stuff done. It’s a blurry line. I am still working on this-it has probably been the hardest learning curve for me, a natural extrovert who loves to be around people. But I also am easily distracted so I have to batch out time on the calendar and say NO to a LOT of things. 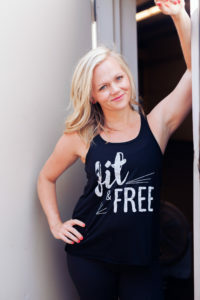 I am trying lately to make some connections to other women with similar visions and missions to mine in the fitness & health industry. In my town, there are only a few in the fitness biz who share the same beliefs as me, but I have found them and plan to make better time with and for them. I definitely want to cultivate a climate of change in our city with these women! If you are buckling down like I have been, don’t forget to poke your head out from time to time and get some “fill” time, but don’t linger in that space forever…easier said than done I am learning! What about you? 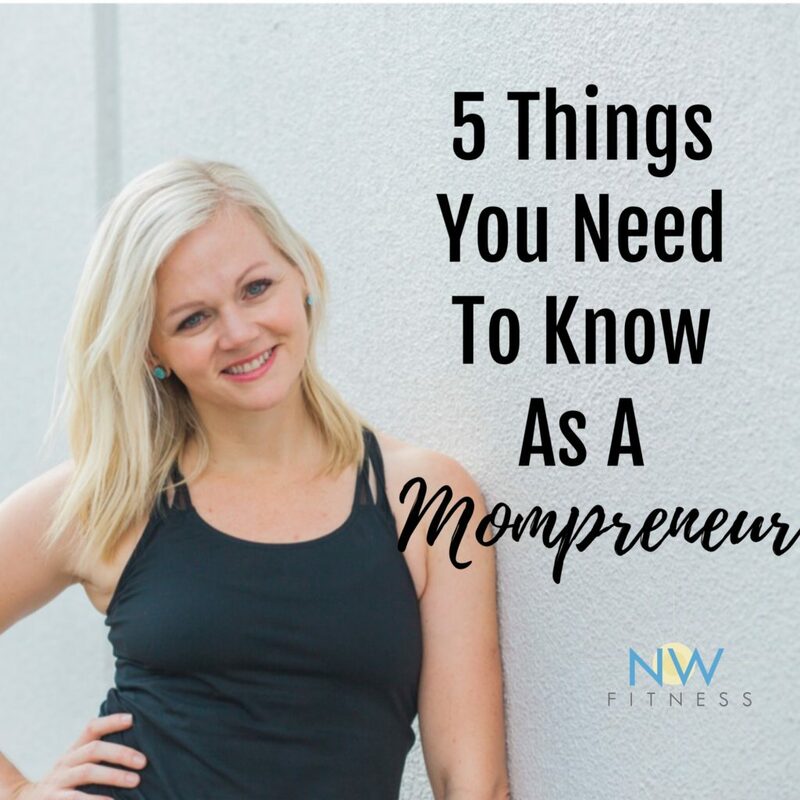 Are you a mompreneur? What are you doing and what advice would you give someone starting out on their journey? I’d love to hear from you!